Travel along the fabled Silk Road past ancient caravanserais and across the remote Central Asian landscape on this trip that takes in the highlights of Uzbekistan. Marvel at incredible Islamic architecture and learn about a history that crosses cultures and spans millennia. Samarkand - Discover Timur's city, where Registan Square lies as its stunning blue mosaicked centrepiece. Our tour starts in Tashkent, the capital of Uzbekistan, which has been on this site for over 2000 years. Although much of it was destroyed in the earthquake of 1966, it has been rebuilt as a modern model city, with spacious avenues and ever-present fountains to cool the air. Today has been left free with no planned activities, as most international flights arrive into the city late this evening or early the following morning. This morning has been left free to relax. After settling into our hotel, we head out with a local guide to explore Tashkent, the capital of Uzbekistan, which has been on this site for over 2000 years. Our sightseeing tour includes various points of interest around the city, like the Independence Square, Navoi Theatre, Old City, Abu Khasim Madrassah and the Earthquake Monument. We also take a ride for 2-3 stops on the Tashkent Metro, which boasts some flamboyantly decorated stations. We rise early this morning for our flight to Urgench. A further 40-minute bus journey will take us to the remarkable ancient city of Khiva, which will be our base for the next two nights. This afternoon, we head to our overnight base in Yangikasgan, where we have the opportunity to go on a short optional camel ride, or simply relax and take in the remote surroundings. Tonight's desert camp accommodation is in yurts, typical of those used by the nomadic people of Central Asia. Yurts are circular dwelling structures made from felt and insulated with sheepskins, traditionally made to be portable. This morning's sightseeing is accompanied by a local guide and takes us to the Shah-i-Zinda - a beautifully-tiled necropolis of tombs, mosques and mausoleums belonging to Tamerlane's family, friends and the prophet Mohammad's cousin. We will also visit the Ulug-Beg Observatory, considered to have been one of the finest observatories in the Islamic World. It was here that Ulug-Beg, the great medieval astronomer, built his gigantic sextant which enabled him to calculate the length of a year to within just 10 seconds. We see the Bibi-Khanym Mosque, once the largest in Central Asia; it was built by Tamerlane with loot from Indian campaigns and named after his favourite Mongolian wife. Light-weight natural fabrics such as cotton and linen are most suitable for the hot summers of Central Asia, it is best to avoid synthetic fabrics as temperatures can get very hot in the summer months. During spring and autumn temperatures are cooler and a good fleece or down jacket plus gloves and hat are recommended for yurt stays in Uzbekistan as the desert temperatures drop at night and a pair of thermals is good as an extra layer, or for wearing in bed. The region is traditionally Muslim so brief shorts and skirts, or clothes that are revealing or tight offend local sensibilities. Women should bring a headscarf as this may necessary for some mosque visits. Please pack a swimming costume. One main piece of baggage and a daysac will be needed as you will not have access to your main luggage during the overnight Yurt stay. Bring sunscreen, a sunhat, water bottle and torch for the Yurt camp. An umbrella is recommended for shade. The yurt camp consists of 20 traditional felt yurts, each accommodating four people. Single rooms are not available. Mattresses, pillows, linen, blankets and towels will be provided. There are 8 showers, 4 (western style) WC cabins and 2 wash basins. Each yurt is equipped with a 220v/50HZ power socket and an electric lamp. Meals will be served in either the ventilated restaurant hut or out in the open air under shade, a campfire will be lit in the evenings. Summer temperatures (May to September) can reach 30-50 degrees during the day and around 20-25 degrees at night time. During spring and autumn, the desert can be very cold at night. This tour takes you on a classic journey along part of the iconic Silk Road through ancient exotic cities and epic landscapes. Not only will you learn about the history and culture of Uzbekistan but you will also spend the night in a traditional nomadic yurt, a highlight for many. 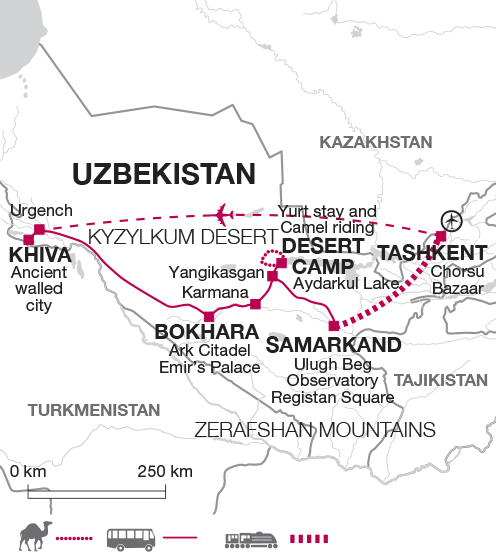 Uzbekistan has been named as one of the top emerging destinations of 2015.